Language Packs change your "Display Language". This means the user interface, or "UI": menus, dialogs and other basic information. 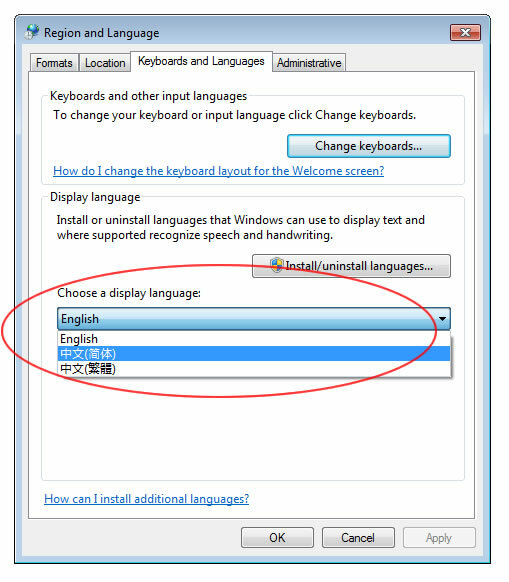 Windows Language Packs are not necessary for reading or writing in Chinese, unless you want to add Chinese speech features, and add Chinese handwriting recognition input to your Tablet PC Input Panel (in addition to the traditional Chinese handwriting input already in a standard system). In Vista you don't even need language packs to use the new handwriting feature, but beginning with Windows 7 the handwriting feature is bundled with language packs. Language Packs for the Windows system and Internet Explorer are free with the Windows 7 and Vista "Ultimate" and (site license and IT department permitting) "Enterprise" versions. Download and installation for Enterprise is usually done by system administrators, but Ultimate users can just run Windows Update, it's easy! Language Packs May Not Be Necessary! 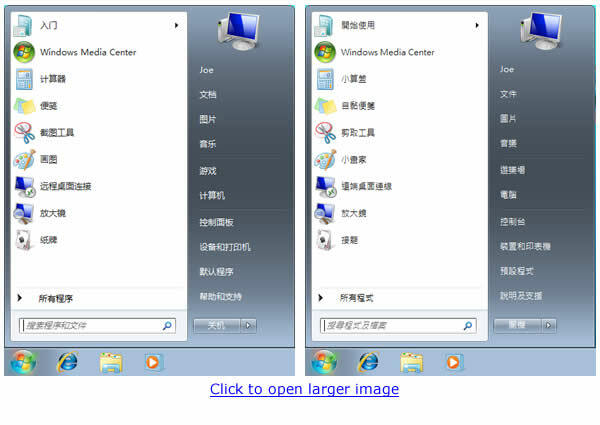 Windows Language Packs are not required to read or write Chinese on your PC. They only change the interface and add an additional handwriting feature. You should already be able to read and type Chinese in any version of Windows 7 or Vista. You usually don't even need a Language Pack to display Chinese filenames, unless the files were created by someone using an older language pack or localized system. Language Packs change only the system and Internet Explorer. They have no effect on the language in the menus and dialogs of any other individual applications. For Chinese menus and dialogs in MS Office (Word, Excel, etc. ), Office Language Packs must be purchased separately. Other software companies (like Adobe) may require purchase of completely separate editions for each language, if available at all. Language Packs are not necessary even if you see "??? ", little boxes or other garbage characters instead of Chinese in some applications or web pages. See my FAQ on changing the default language for non-Unicode programs and websites if Chinese will not display correctly in some but not all apps or web pages. You do not need a Language Pack for this. Chinese Handwriting is already in your "Chinese, Traditional" (Taiwan/HK,Macau) "IME Pad", in the Language Bar's Options menu. You do not need a Language Pack just for that. This is the only way to get simplified character handwriting input, but for traditional characters this is in addition to a handwriting feature you already have in your IME Pad after activating one of the Traditional IMEs' input methods. 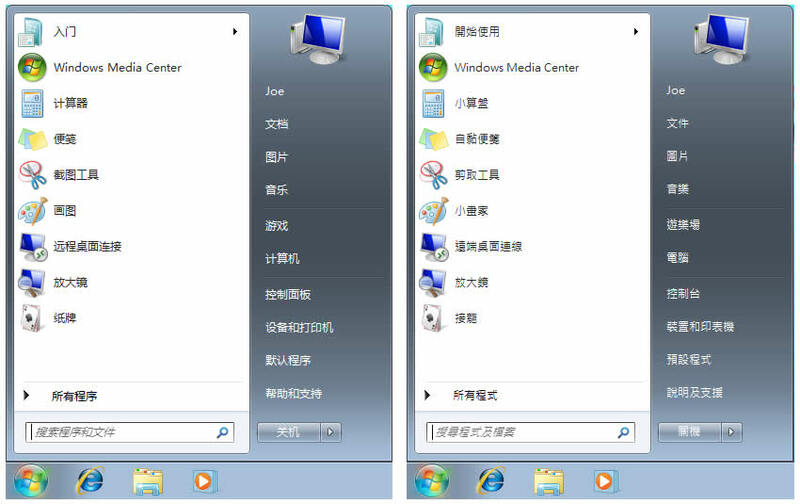 In Windows Vista you do not need to upgrade to Ultimate or Enterprise just to add Chinese handwriting to the Tablet PC Input Panel, because this is not locked up in the Vista Language Packs. This is a new Windows 7 "feature". To give Windows XP a Chinese interface I had to purchase a special "Multilingual User Interface" bundle with a new copy of XP Professional. 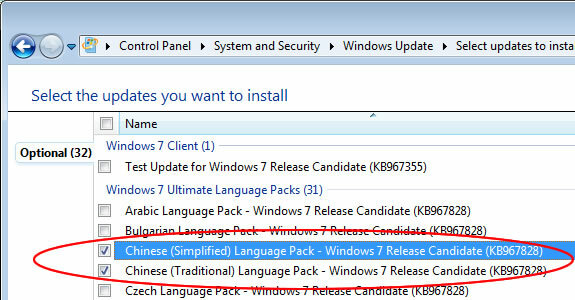 Windows 7 Language Packs are available as free downloads for owners of Ultimate and full licenses of Enterprise. Free Online Translations for Microsoft Menus & Etc. I'm going to show you how to install Language Packs in Windows 7 or Vista Ultimate. If you have Windows 7 Enterprise, usually an IT administrator will have to download this via your organization's volume licensing account and I am not able to help with that. But in Ultimate, all you have to do is run Windows Update! or Start menu > Control Panel > System and Security > Windows Update. You'll find all the available Language Packs listed as optional updates. Select the checkboxes next to the packs you want, then click the "OK" and "Install Updates". Note: Internet Explorer Language Packs began showing up as separate downloads a year or two after Windows Vista was released. I suspect this was due to a European Commission ruling requiring more separation between the system and IE, but by the time you read this Microsoft may have negotiated a way to combine the downloads again. 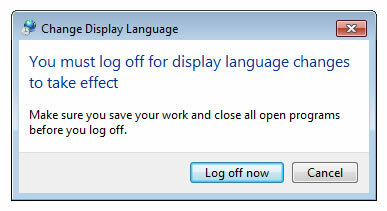 Select a display language, click "OK", and then log out and log back in to complete the change. You do not need to restart. Simple, yes? Feel free to write me via the "Contact" link below if you have any questions or suggestions. Being "Pinyin Joe", I never wrote much about Chinese handwriting input (except to agree with you that this feature should not require an upgrade to Windows Ultimate or Enterprise!!!) until handwriting on Windows 8 tablets arrived. I also haven't written much about Chinese text-to-speech or speech recognition, but feel free to write if you're having problems with any of those and I'll do my best to help.